Next year will be a big one for us as a club as we celebrate our 100th birthday. Our centenary will be a very special season for everyone connected to Queen of the South. Supporters have already had the chance to have their name printed in history, with the opportunity to add their name to our centenary shirt. We are now offering companies and individuals the chance to be the shirt sponsor for the important season with the launch of our annual draw. As you can see from the attached information, the draw has proved very popular over the past 21 years, with a wide range of names embossed on our strip and you could be next! 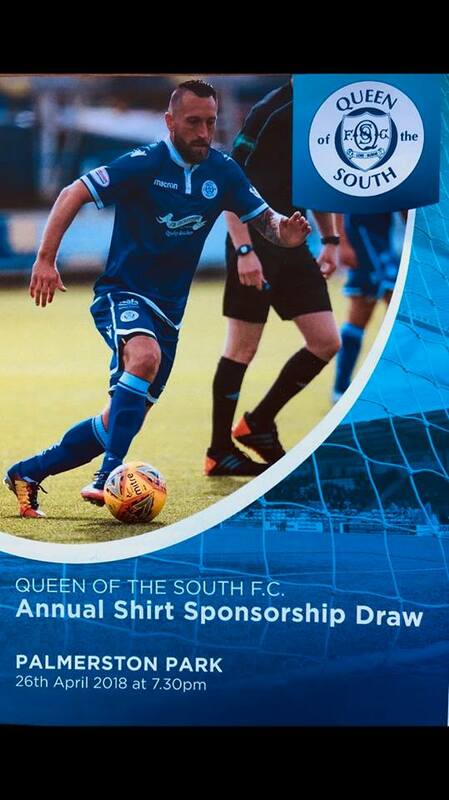 The main aim of Queen of the South FC is to build a sustainable club which can compete in the top flight of Scottish football. Things are currently going well on and off the park. On the pitch, we are still able to compete for one of the play off places and if we can achieve our aim then you could have your company name on the front of our centenary shirt in the top tier of our national game. And with television and newspaper coverage of football at a premium, what better chance to have your name in the spotlight, including live on Sky Sports, BBC Scotland and BT Sport. Behind the scenes we are constantly improving facilities. This season we have upgraded the floodlights, in the process of restoring the murals on Terregles Street. The Queen of the South Arena is continually expanding with rental space becoming occupied. In season 2018/2019 we hope to continue the success both on and off the field and we'd like you to be part of it. The draw for our 22nd shirt sponsorship will take place on 26th April 2018. As always your continued support is very much appreciated. We understand the financial restraints on many, but this is a great opportunity to show your support for your local senior football team.